We set out for the ‘old city’, found it and arrived at the tea-house in the middle of the fish pond with a zigzag path. That was just as it was in 1986, but the so called ‘old city’ is now where there had just been some scruffy streets and shops and where two Chinese students had spoken German to us – no scam then. 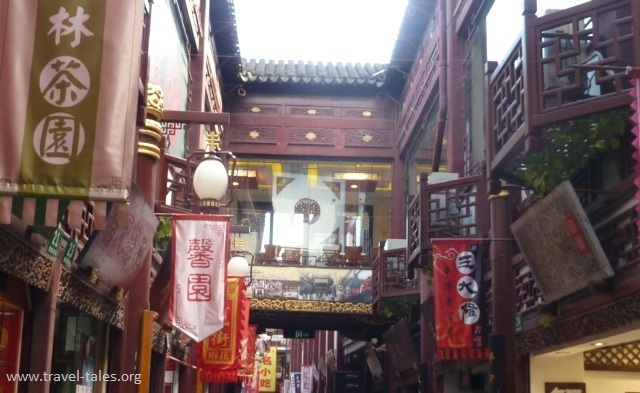 The Old City consists of the Huaihai Road, Renmin Road, Dongtai Road, Fangbang Zhonglu, Dajing Lu, and Shanghai Xintiandi. It is of course not old at all, just rebuilt to look old. We went into the Yu Yuan park, which we had visited last time too. It is a lovely place and very peaceful amid all the city rush. It was finished in 1577 by a government officer of the Ming Dynasty (1368-1644) named Pan Yunduan. Yu in Chinese means pleasing and satisfying, and this garden was specially built for Pan’s parents as a place for them to enjoy a tranquil and happy time in their old age. In the 400 years of existence, Yuyuan Garden had undergone many changes. During the late Ming Dynasty, it became very dilapidated with the decline of Pan’s family. In 1760, some rich merchants bought it and spent more than 20 years reconstructing the buildings. During the Opium War of the 19th century, it was severely damaged. The garden we see today is the result of a five year restoration project which began in 1956. It has been open to the public since September 1961. More of the garden next week!